Carl Icahn stocks are back in focus today after the activist investor announced several major new purchases. Icahn announced a plan to purchase the auto-parts company Pep Boys-Manny Moe and Jack (NYSE: PBY) today for $837 million. Cheniere Energy Inc. (NYSEMKT: LNG) stock climbed 3.4% yesterday (Wednesday) when U.S. President Barack Obama vetoed Keystone XL pipeline legislation. LNG stock has been one of our favorite energy picks for more than four years. Money Morning Global Energy Strategist Dr. Kent Moors first alerted readers to its profit potential in November 2011 - when it was trading at $10.37 a share. 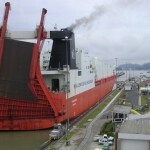 The Panama Canal is getting a makeover that will allow it to accommodate ships as long as three football fields, with the capacity to carry almost three times the amount of cargo. Once completed, the "new" canal will help jump-start U.S. LNG energy exports to Asian countries.